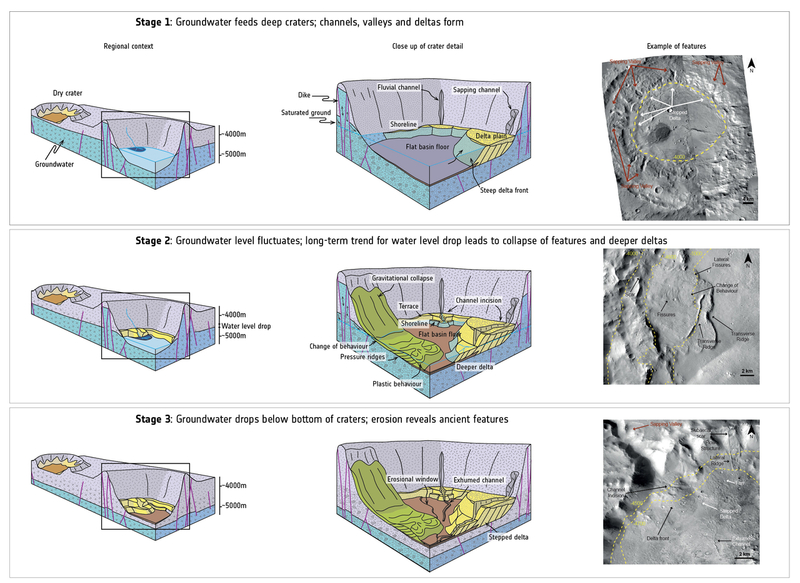 This diagram shows a model of how crater basins on Mars evolved over time and how they once held water. This model forms the basis of a new study into groundwater on Mars, which found that a number of deep basins – with floors sitting over 4000 m deep – show signs of having once contained pools of water. Images (from the context camera onboard NASA's Mars Reconnaissance Orbiter) show examples of the different features observed in the basins. There are three main stages: in the first (top), the crater basin is flooded with water and water-related features – deltas, sapping valleys, channels, shorelines, and so on – form within. In the second stage (middle), the planet-wide water level drops and new landforms emerge as a result. In the final stage (bottom), the crater dries out and becomes eroded, and features formed over the previous few billions of years are revealed.